How Nevada's Entrance Polls Turned Into A Political Fight Over Latinos The entrance polls said Sanders won Latinos in Nevada by 8 points, but results showed Clinton won Hispanic-heavy precincts. What gives? 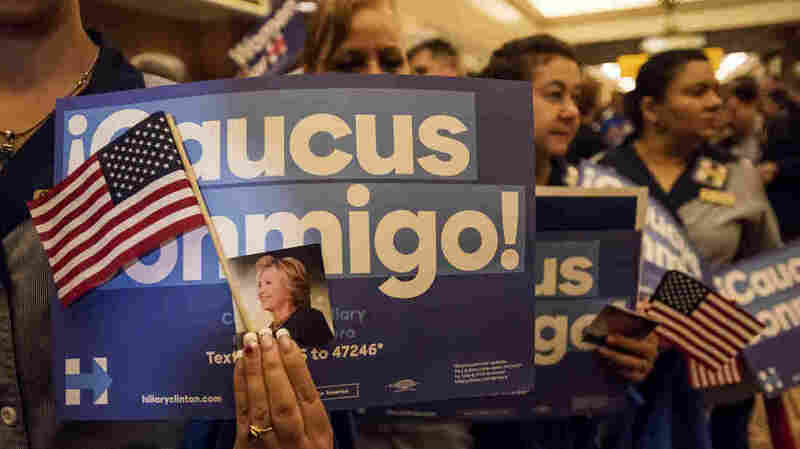 "Caucus conmigo" ("Caucus with me") signs were a common sight at Clinton events in Nevada. What exactly did we learn about the Latino vote this weekend? Take your pick of headlines. To be clear, these analyses are all smart and totally worth a read. But still, no one has a firm answer. So what's a political junkie to do? There are a few big lessons here, both about the limits of entrance and exit polls and also about the difficulties of trying to generalize about a large, diverse demographic group. If you missed the fuss over Nevada's entrance polls, here's the short version: The exit polls came back on Saturday showing that Sen. Bernie Sanders had 53 percent of the Latino vote to Hillary Clinton's 45 percent. That finding raised eyebrows almost immediately, for good reasons. After all, Clinton won Latinos by a huge margin in Nevada back in 2008. The Clinton campaign fought back, pointing out that it won in heavily Latino districts in Clark County. It sent out a memo from polling firm Latino Decisions (which works with the Clinton campaign) showing that in a few precincts that were more than 80 percent Latino, Clinton won the overwhelming number of delegates. It wasn't just the Clinton campaign making that argument, of course: both the Times' Nate Cohn and Vox's Dara Lind pointed out Clinton's strong performance in highly Latino precincts. As Cohn put it, it's "a stretch" to think that Clinton did so well in those areas but that Sanders compensated for that in other, less-Latino areas. We're never going to know exactly how Nevada's Latinos caucused once they were in their polling places. But for people who are glued to their TV sets (or, even better, radios) or computer screens on election nights, here's what you can learn from the confusion in Nevada. In lots of regular political polls, the goal is a random sample. Exit and entrance polls, however, do what's called cluster sampling — that is, they go a few spots and get a lot of responses from each spot. More specifically, Edison Research, which conducted the Nevada entrance polls, went to 25 polling places across the state — selected at random — then interviewed people there before the caucuses. That can make the results more unreliable. "By luck of a draw, you could miss a well representative sample. Now, that's not going to hurt you if you're dealing with a full sample of 1,000," said Clifford Zukin, a political science professor at Rutgers University, who specializes in polling (and who also used to work for Edison Research). And indeed, the full exit poll had a sample of 1,024 people. But break it down into smaller groups — like the 213 Latinos surveyed — and you could have a bad sample, if those Latinos are from nonrepresentative "clusters." An entrance or exit poll has a margin of error, just as any other poll does. And the smaller the group you're measuring, the bigger the margin. The margin of error on the Latino vote in Nevada was plus-or-minus 10 percentage points, according to Joe Lenski, executive vice president of Edison Research. And given that 8-point gap between Sanders and Clinton, that means it's entirely possible that the candidates tied — or even that Clinton led Sanders among Hispanics. So while everyone is arguing over Hispanic voters, that doesn't mean you can't trust the other breakdowns for the other demographic groups. After all, no one is arguing about whether Clinton won African Americans in Nevada — an even smaller subgroup than Latinos. And that's because Clinton won that group so decisively — 76 percent to Sanders' 22 percent. The question is once again one of margin. Lenski also points to the group's finding that Clinton won people in union households, 54 to 43 percent. It's quite possible that the reality was much closer than that. There's a tendency in any election to talk about most demographic groups as voting blocs ("the women's vote," "the black vote," etc.). And there are good reasons to try to see how particular groups are trending and why — black voters very much do tend to vote Democratic, white self-proclaimed evangelicals tend Republican, and so on. But Nevada's Latinos are a reminder that any given voter has several identities that can play into how they choose. Consider that Nevada's Latinos tend to be younger than those in the rest of the nation. That might have helped Sanders, says one analyst. "We know that Sanders has been doing awfully well with young voters," says Gary Langer, founder of Langer Research Associates. "It all kind of seems to fit." In an analysis at ABC News, he points out that Sanders seems to have done nearly as well among young Hispanics (who were, admittedly, an even smaller subset of the total entrance poll sample) as he did among younger non-Hispanics. In other words, age — not just ethnicity — could have played a big role in these results. If that's true, there may be something going on here like the conversation over women in this election. People keep asking why more young women aren't supporting Clinton. It's not necessarily because they, as women, are turning away from Clinton. Rather, Sanders seems to have a particular draw for young people, women and men alike — or, perhaps, Hispanic and non-Hispanic alike. Lenski added that younger Latinos tend to live in lower-concentration neighborhoods, so it is quite possible that he overperformed in those areas. There's a reason the campaigns have seized on this question of entrance polls, said Edison's Lenski. "This is a political argument," he said. "The only reason this is an issue is because the Sanders campaign wants to trumpet its strength among Latinos, and the Clinton campaign wants to make it very clear that they're not losing support among Latinos." OK, it may not be the only reason — after all, inquiring minds in the fourth estate want to know. But, as the campaigns look ahead to more highly Hispanic states, like Texas and Florida, they want to be able to say they have momentum among this group. And that means squabbling over numbers that, come Election Day, everyone will have forgotten. Well, nearly everyone.